Despite what the weather is doing, spring is definitely on the way bringing us longer days and warmer nights. It’s time to get ready for spring inspired cocktail parties, potluck dinners, and leisurely brunches. Setting a table can be a lot of work, but it’s a whole lot of fun and totally worth the effort. Here are some simple tips to help you set a succulent spring table, making good use of the bright and blooming season ahead. Start fresh. Spring tablescapes are about texture and nature, so clear your table and take a look at what you’re working with. If you have a fabulous wooden table, don’t cover it up! If you need to hide your table, choose a plain neutral-coloured tablecloth. Cloth is the only choice! Bring nature inside. Flowers and foliage are essential to setting a spring themed table. Fresh wild flowers arranged in mason jars are a simple and subtle way to add colour. For a sunny scene, mix daffodils and white peonies with a little greenery in staggered-height vases. If you want grass on your table, consider using wheat grass. It can be purchased by the flat or you can grow it indoors from seed, allowing 7-10 days for germination. You can easily pop it into mason jars, or small metal buckets, and include a few foiled chocolate eggs hidden between its blades. Fresh-faced daisies and colourful tulips partner well with wheat grass, adding pops of colour here and there. Moss and branches are an easy way to add some rustic charm to your table. Layer up. Layers on a place setting are a great way to add dimension and depth to any table. Use a pretty table runner, cloth napkins and patterned underplates (if you have them). If you have beautiful lace doilies, place them on top of your table runner to add a little more depth. They are also a great way to fix your flowers on the table. Get personal. Place cards are a way to personalize your table and control the seating arrangement. There are endless ways to get creative with seating cards, especially if you have a theme going on (hint: Easter is coming!). Excellent seating card examples are to: flourish plain cards with a single tissue-paper flower and calligraphy; pin each name card to a luscious lemon (or piece of fruit); affix each card to the flatware (or napkin) with polka-dot ribbon; and paint each name on an Easter egg. Each of these work best when placed in the centre of a plate. You can also skip the place cards entirely and set fresh sprigs of lavender and thyme secured with twine on top of each plate. Set the table. Be sure to include enough flatware for each course, along with a separate water and wine glass. Layer your dishware accordingly and ensure that there is plenty of space to fit serving dishes. Be sure to set out the right glass for the right drink, such as highball glasses for Mojitos and Champagne flutes for Champagne. Add texture and height. Pitchers filled with lemon water, a tray for coffee (or tea), and a board for bread and cheese will give your table visual separation and sophistication. Height can also be achieved by staggering different sized vases at the centre of your table. Create ambiance. Aside from being functional, candles add ambiance and intimacy to any table setting. Grouping an unscented votive with two tea lights across you table is a great way to let in some light. You could also use a floating candle bowl or candelabra as your main light source, setting a few tea lights across the table to accompany it. If you are planning an Easter gathering, be sure to include a fun after dinner project like painting Easter eggs, or painting macaroons. Macaroons are colourful, simple, and they double as a delicious dessert item or take-away. Easter decorations like bunnies, birds, and chicks are great decorations to include on your table. Gold accents would be a fabulous addition to any Easter tablescape. 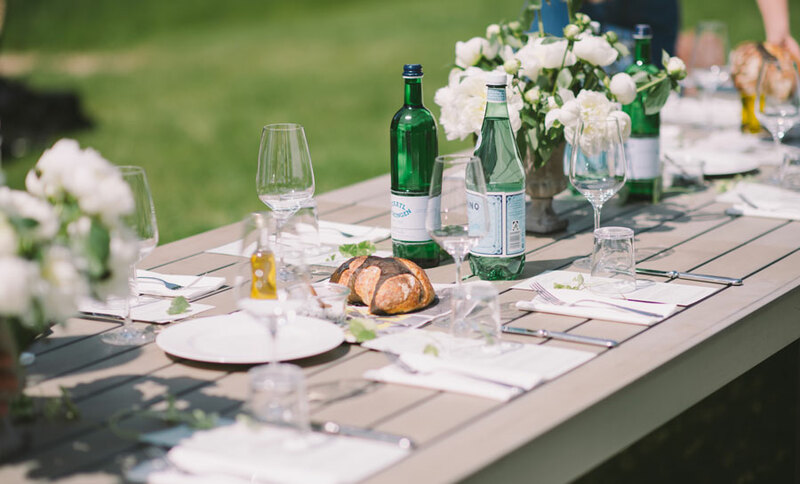 While there really are no rules when it comes to getting creative with your table setting, there are a few things to avoid. Tall and obtrusive objects will block guests from easy conversation. Clutter is never a good thing, so don’t go overboard with seasonal knickknacks, candles or too many flowers. When in doubt, check to see that you have one focal point and ensure that there is a balance of objects across your table. No matter how you choose to set your table, make sure that there is enough space between plates to pass the wine! Don’t make a trip to the store for one gathering. We are stocked with dishware, flatware, glassware, serving dishes, linens, and cloth napkins. We also have that extra table if you need it, along with matching chairs so your guests won’t ever be sitting on the floor. And don’t forget the best part—we always do the dishes for you! All you have to do is use them, stack them up when the night is over, and walk away. We pick-up! It really is that awesome. No matter what you’re planning, we have an extensive selection of event rentals, novelty items, and creative decorations—like paper straws and wine clips—for you to choose from. Give us a call at 250-871-4646 or email info@relayevents.ca so we can help you set your table. Come visit our showroom at 2-1255 McPhee Avenue in Courtenay. You will always find our friendly, experienced team happy to see you.